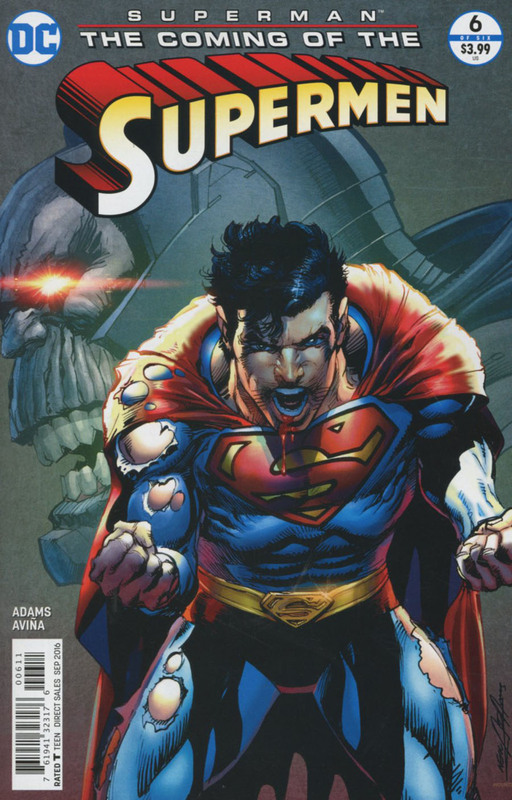 "The Coming of the Supermen" - Part 6: "Answers"
We pick up from the events of last issue, where Darkseid is being mocked by a maniacally laughing Lex Luthor. Who supposedly was obliterated last issue? In an angry rage, Darkseid lets slip the revelation that Earth was the birthplace of Apokolips and possibly New Genesis. Darkseid leaves to return to home, but Superman flies through the boomtube first. Once he gets to the other end of the tube, he is confronted by the Messenger. The Messenger offers insights to both Superman and Darkseid, which he understands but Superman doesn't. Rafi and his dog Isa are revealed to be New Gods. Isa was Highfather in disguise. The Kryptonians help turn back an assault by the forces of Apokolips. Superman destroys Darkseid's Boomtube, defeating Darkseid, who is spoken to by The Messenger, now called El. Darkseid then walks off in defeat. The New Gods and Rafi bid farewell to Superman as they leave for their home. Luthor learns the true origins of the New Gods, and keeps a shocking realization to himself that they are all human. Story - 2: This book (and series) is the Sharknado of comics. This final chapter is called "Answers", but leaves too many unanswered... Darkseid's father, why are the New Gods human, Why was Highfather disguised as Isa the dog, who the Messenger is, Why is his name "EL", and what significance does that have to Superman's own lineage being from the house of EL himself, and why was Darkseid afraid of him? I'm the type of person that really tries to look for the good in things, but I really don't know what to make of this at times. Darkseid lets slip in his angry rant that the New Gods origins have ties to Earth possibly on page 4, and on page 5 both Superman and Lex repeatedly ask "what"... This is a revelation that doesn't really pay off at all, just causes more confusion. As I mentioned above, there are so many unanswered questions. And now even more so, with the sudden revelation that Isa the dog was really Highfather in disguise all this time, along with Rafi being a child of the New Gods (Grandchild of Highfather)... What was the point of all this? Why was Rafi in the Middle East in the first place when we meet him? There was some good banter between characters, and as usual, random dialogue... Superman's "Im going to enjoy every second of this" was amusing, but Rafi's "Go Go Power Rangers" was completely out of nowhere... I really don't know what else to say about this book... It's as if the book was drawn from scribbled notes, and then published. Also, why is Luthor just standing around at the end... Is there no consequences for his actions? In saying that, last month I was listening to one of my favorite podcasts (Views from the Longbox), by the Homepage's very own Michael Bailey. He was joined by his semi regular co-host Andy Leyland. They did a commentary track for Sam Raimi's Spider-Man 3. In it, they mentioned with creative editing, the movie can be saved, and made into something more workable/likable than what it was. I had the same thought about this book. It can be "rewritten" in dialogue and some caption boxes added, and possibly be made into a halfway decent story. Just need someone creative enough to do so. As I mentioned in last month's review, this book has two editors... If Neal Adams is going to be ripped to shreds for this book, they need to be also... Or at least not be paid for editing this book. Whatever the case, it's over and done with now. Adams managed to show great majesty to Jack Kirby's Fourth World characters. I loved the fact that they all are larger than Superman and most humans. The first half of this issue showed Superman, Darkseid and Lex, and really just dealt with their faces, as they faced off with one another. Adams is a master at facial expressions and really getting the point across as to how the conversation is going. If you ignore the dialogue, the art still tells the story. Which in my opinion, is truly amazing storytelling... Then again, that is why Neal Adams was and still is such a legend, he tells exceptional stories through his art. The industry wouldn't be what it is without him. Darkseid's angry expressions and Luthor's mocking and later frustration were absolute joys to look at. I can't express enough how much I enjoyed Adams take on what was happening with these characters. Also how casually Superman just sits down, and lets these two go at each other. "I'm going to enjoy every second of this"... Even without the thought balloons, you could tell this is what he was thinking! The action didn't skip a beat at all this issue either. I loved Superman flying into action on pages 10 and 18. The way Adams had him twist and turn, seemed so acrobatic and fluid, almost ballet like. It's something that really isn't done so much with Superman. Which is a shame, as other artist really show him being so stiff on the page when he fly's. It reminded me of a lot of what Christopher Reeve did in the first two Superman films as well as some of the Fleischer animated Superman shorts from the 1940s. I also really loved the scene where Superman snatches Darkseid's cube and crushes it in his hand turning it to dust. Followed by taking a punch to the directly to the face by Darkseid. That scene in particular, showed not only Darkseid's rage and anger at Superman, but also Superman's own power and invulnerability, by taking the punch dead on, and then pretty much brushing it off. Conveying such a thing through art can be very difficult, but Adams managed to do it with ease. It was great to see Highfather. Again I must mention, there was just so much majesty with his presence on the page. I loved how much bigger/taller he was than Superman. Such Godlike stature. Orion made a return with his "angry face," but it was a shame that Mr Miracle and Big Barda were absent. Oh and Lois was there... Sitting around waiting for Superman... On what looked like a lawn chair. Adams really made Superman look strong, majestic and downright cool in this series. We saw an angry Superman, a frustrated Superman, a cocky Superman and a smiling Superman. Superman smiling is something that's been missing from almost 90% of all Superman media. It's great to see, as a character with such an immense power set, it's good to see him not looking so vengeful all the time. Tony Avina has done an amazing job with the coloring. He managed to keep the tone of the book consistent. He is a great colorist, and hope he continues to get good gigs in the future on DC books. I'm still stoked that the colorist now gets credit on the cover. Final note, it may have been an absolute crazy confusing and zany read, but I must say, I had fun, it never seemed like a chore that I had to read and then write a review for it. Coupling that with the amazing artwork and the nostalgic feel, I really still am so grateful I had a chance to review this book. Thank you, Neal Adams. Cover Art - 4: Adams is joined by Paul Mounts for the final cover of this series. I must say, I really do love the composition of this cover, I battle weary Superman standing his ground, with a looming and very angry Darkseid in the background. This is just a classic looking cover, something that Neal Adams excels at... Sadly, the battle torn costume and bloody and battered Superman really didn't happen in this final chapter, so it is misleading, as have many covers for this series have been.... But at least Superman is wearing trunks!